Remembrance Day has always been important to me. Maybe because my Uncle Leo Hancock, my mother's brother, fought in World War II, landing on Juno Beach on D-Day and surviving to tell the tale. Maybe because LeRon's Uncle Smellie Redd and Uncle Bryant Jensen both were in the war. Maybe because many men in my Ward in Taber, Alberta, Canada also served in the war -- men such as Dale Clifton, Norman Hall, Henry Renner, Burns Wood, Ray Evanson. Henry Renner always walked with a limp due to injuries from the war; he was in pain every day. He also had recurring nightmares but he never complained in public. I thought he was amazing. And Burns Wood was amazing too. He had only 3 hours of flying lessons before he was piloting war aircraft. He said that farm boys were mechanically minded so it wasn't hard to learn to fly! We in Canada commemorate Remembrance Day on November 11th each year. World War I ended on the 11th day of the 11th month at the 11th hour. 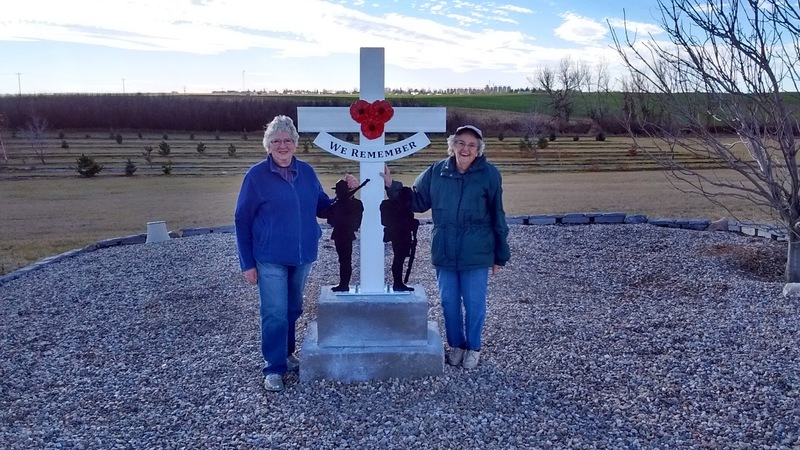 So if I were home this year, I would have gone in to Taber to the Remembrance Day commemoration and I would have joined with hundreds of others standing for the two-minutes of silence in remembrance. But I am in Kenya where they have different challenges -- including conflicts in countries surrounding us and also the constant threat of terrorism. Kenya, as part of the British Commonwealth, also commemorates Remembrance Day but not quite like we do in Canada. LeRon and I will wear poppies on Sunday. (They commemorate on the closest Sunday to November 11). LeRon and I have been several times to war sites in England, France, Belgium, and also Germany, and have felt the spirit brooding over those places. Three of our kids have also been to these sites and it has been sobering and moving to them also. People in those countries definitely remember and are continually grateful for the freedoms they have. Our youngest son, Eric, has written two posts about his experiences in visiting these places. His first was written in 2009 and the second in 2010. They are both excellent posts about these places with gorgeous photographs. Eric is an amazing photographer. Highly recommended to read these posts! 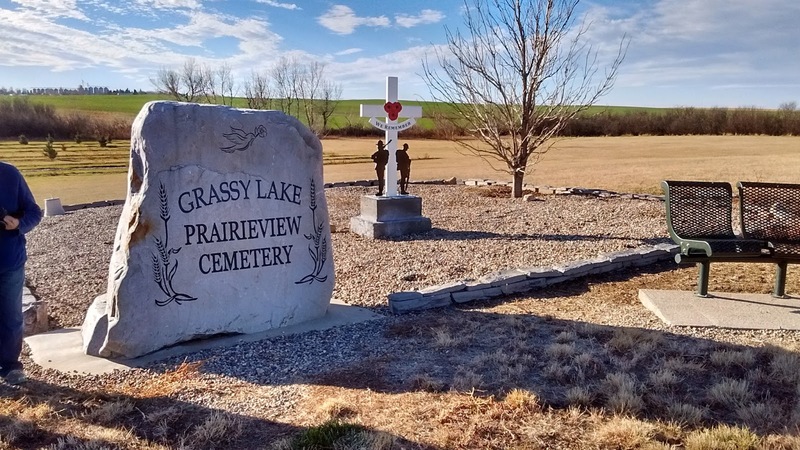 Photographs to follow are of a memorial monument that my sons Michael, Craig, Eric, and I made for the Grassy Lake Cemetery. Grassy Lake men such as John Kast and Con Kast and others served in World War II. John Kast was a young married man with a wife but he volunteered for service because, as he told me one day, "Someone had to go and stop that mad man" referring of course to Adolf Hitler. There are many mad men today too. We need to fight for our freedom and be grateful for what we have. 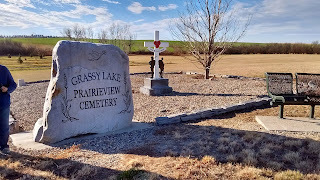 I have been serving as the president of the Grassy Lake Cemetery Committee. We beautify the cemetery and keep it clean. So good to honor and remember those who have passed on before. We don't have a lot of money to work with so we were unsure of how to build a fitting monument to those who served in the wars. 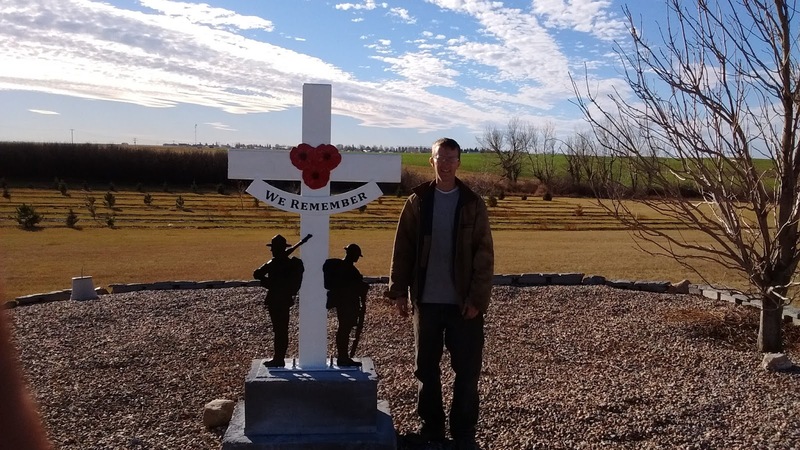 I found an idea on the internet and with the help of my amazing sons, we came up with a low-cost design for a small monument. The Cemetery Committee installed it on November 10 of this year. I was so pleased to be able to talk to committee members over Voxer and see the installed monument. Be sure to click to enlarge the photo. Eric helped design and cut out the soldiers and Michael (above) spent weeks painting and re-painting so that it would be protected from the weather. It's all made of heavy steel and bolted into concrete. (Grandpa Marvin Torrie would be pleased that his grandsons are carrying on his work with welding and steel!) It's very heavy and should be sturdy enough to resist vandalism. Sad that we have to worry about vandalism in a cemetery that should be respected. 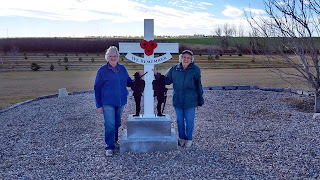 Here's two of our committee members, Faye and Elsie, with the monument. Wish I could have been there too! This is wonderful--the memorial at the cemetery! I also love Remembrance Day, although I don't do much from here in the US except wear a poppy. Uncle George and Uncle Bill also served in Canadian Forces in WW II.